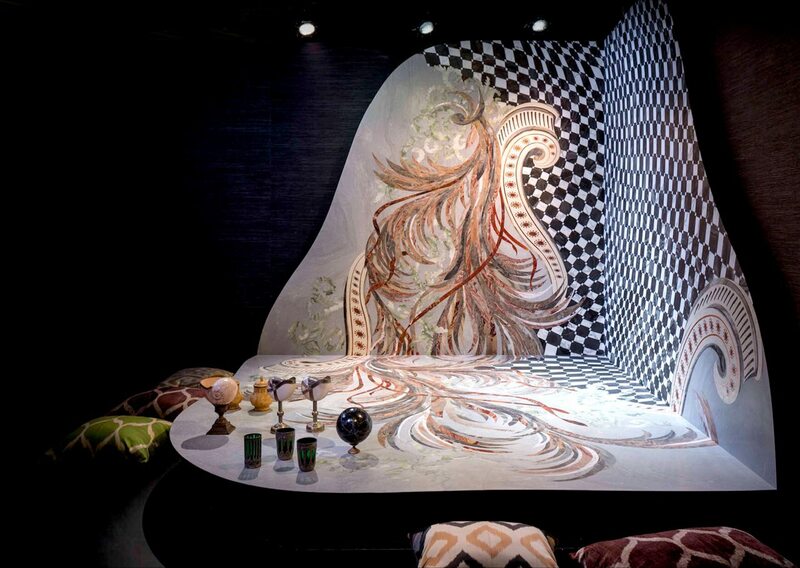 At the Salone del Mobile 2017, Budri, the acclaimed Italian company renowned the world over for its exquisite craftsmanship with marble and semi-precious stones, presents “The Silk Road”: an emotionally engaging, evocative itinerary that juxtaposes seemingly contradictory elements, reconciling the lightness of silk with the apparent heaviness of marble. An astonishing journey that leads the visitor into the exhibition space through a tunnel created with tone-on-tone Nero Marquinia marble inlays for a damask silk effect, leaving visitors awestruck as they follow “the silk road”. Then, lo and behold, the interior of the space presents a ‘jewel’, an artistic inlay covering wall and floor. The ‘feather’ pattern with marbles, semi-precious stones and bronze symbolises lightness and sinuosity. A geometric motif in black and white stones, embraces a sumptuous, serpentine architecture in antique white marble and jasper. Silk cushions are placed around the suspended inlay, becoming a Tatami Table, a precious surface that extends a warm welcome.